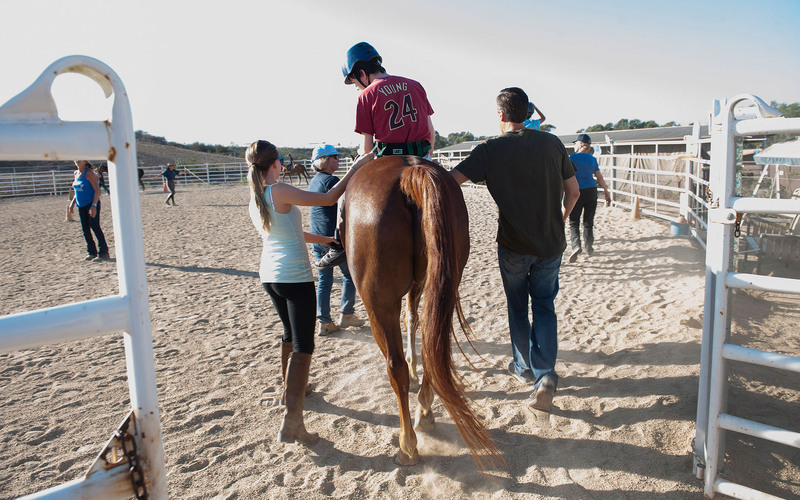 Therapeutic Riding Proves More Than Horse Play - Caboodle - We fight conditions & disorders through knowledge & community. Parents and caretakers are almost unanimous – for those with disabilities, there’s something about horses. The relationships and bonds formed with the animals can be transformative. HUNTINGTON BEACH, Calif. – Eddie Brennan is all charged up. The hyper 4-year-old, who has autism, has already charged through a puddle, and writhes as his nanny struggles to remove his shoes and socks. But when Brennan climbs on the back of Kattie, a dark bay therapy horse, something magical happens. The kinetic little boy becomes like Jell-O, melting into the horse, contented and somehow soothed. He sits or lays on its back – even rides backward. It’s as if he has a connection to the horse. When Leo found horse riding, she described it as something akin to souls communing.